The overdue recognition that development in all sectors is an inherently political process is driving international aid providers to try to learn how to think and act politically. A new lens on development is changing the world of international aid. The overdue recognition that development in all sectors is an inherently political process is driving aid providers to try to learn how to think and act politically. Major donors are pursuing explicitly political goals alongside their traditional socioeconomic aims and introducing more politically informed methods throughout their work. Yet these changes face an array of external and internal obstacles, from heightened sensitivity on the part of many aid-receiving governments about foreign political interventionism to inflexible aid delivery mechanisms and entrenched technocratic preferences within many aid organizations. 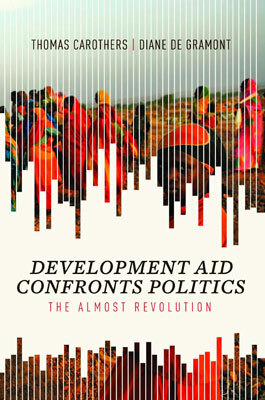 This pathbreaking book assesses the progress and pitfalls of the attempted politics revolution in development aid and charts a constructive way forward. --foreign aid, encompassing goals such as democracy promotion as well as addressing the political economy of economic reform-- In prasctice foreign aid is always attached with deamands which are not necessarily demoracy promoting nor nation building. Foreign donors generally have their own agenda and try to control the receiving countries. Development Aid Confronts Politics addresses the purport of the word "political" in foreign aid, saying that something changed around 1990. As the book does, however, we must first distinguish different senses of the word "political." In the context of foreign aid, prominent uses of the word "political" include: 1. Aid decision making by a political agency, rather than by a development agency. 2. Giving aid for a political reason rather for a development purpose. 3. Engagement in partisan political activity in the recipient country. 4. Adopting a "political" lens in assisting legislatures, judiciaries, law enforcement, human rights agencies, journalism, etc. 5. Engagement in the host country's implicitly political process of public policy analysis, debate, and capacity building. In the first two senses, foreign aid is always partly political and partly not. What happened after 1990 is that, in selected cases, U.S. foreign aid in particular started being political in the third and fourth senses. This was primarily a response to the institutional changes occurring in the former Soviet Union: ironically USAID was more engaged in the Cold War after it was over than when it was still on. Because foreign assistance is "foreign" and "assistance," it depends on its hosts' acceptance and on their initiative. U.S. foreign aid's engagement in partisan, anti-government politics since 1990 has in some cases, as the book notes, lost aid its acceptance and resulted in expulsion or near-expulsion. With respect to the fifth sense of "political," it's frequently useful (as the book urges) for development assistance to engage in and support public policy debate. Although implicitly political, constructive policy debate is non-partisan and not anti-government (even when seeking to improve the government's policies), so it's common for aid agencies and host governments to agree that aid should support the participation of the interested public. The book has an unfortunate tendency to interpret aid's long history of evaluating and seeking to do better on governance matters as a confession of failure or indifference. The opposite reading seems to fit better. Also, the concern for under-appreciation of specialist Democracy Officers seems overdone. The book's views on economics ("Economics emphasizes consensual ideas") and on the history of development economics' impact on aid deserve a separate discussion.